The heavily contentious multi-million Ringgit divorce demands by Shahnaz Abdul Majid against her former husband Sarawak business entrepreneur Datuk Seri Mahmud Abu Bekir Taib, continued today at the Kuala Lumpur Shariah Appeals Court, the highest court in the Shariah judicial system, where the parties argued on child maintenance sought by his former wife for their only son. Lawyers Datuk Zainul Rijal Abu Bakar and Saadiah Din with Datuk Seri Mahmud Abu Bekir Taib. Shahnaz had claimed in excess of RM121 million for child maintenance for Raden Murya Abdul Taib Mahmud to include a terrace house in London (RM60 million), a residence in Bukit Tunku (RM10 million), two Aston Martins (RM5.5 million), medical insurance (RM5 million) and a private trust fund (RM40 million) to be held and managed by her. Lawyers acting for Datuk Seri Mahmud applied to have Shahnaz’s RM121 million child maintenance claim struck out on the grounds that the couple’s son had under the provisions of the Age of Majority Act, 1971, reached the age of 18 and therefore, in full capacity to be an independent litigant as a major. Raden, born on 11 December 1993, would today be 21 years 6 months old and no longer a minor to be managed by his mother. Their son, it was argued, is a full grown adult. As such, Datuk Seri Mahmud contended that Shahnaz had no capacity to initiate multi-millon Ringgit suits against him on behalf of Raden. 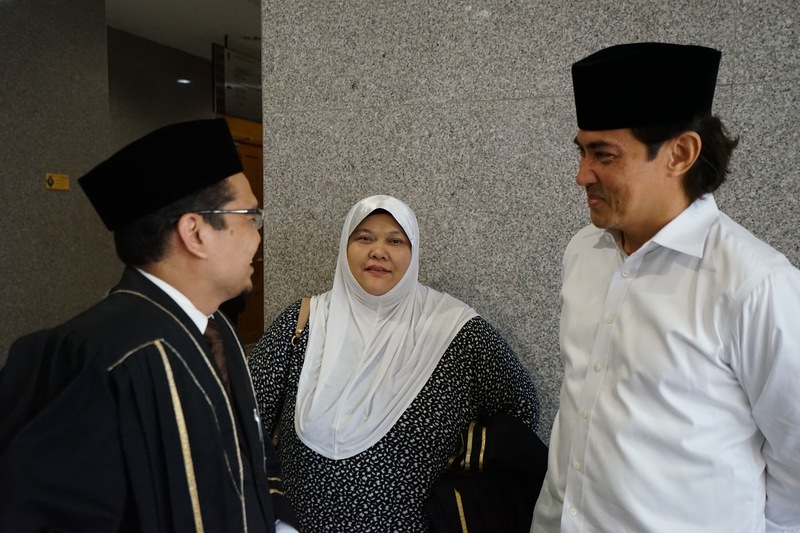 The appeal was heard before Chief Shariah High Court Judge of Wilayah Persekutuan Datuk Mahammad bin Ibrahim; Chief Shariah High Court Judge of Perak Datuk Muhamad Asri bin Abdullah and Shariah High Court Appeals Judge Datuk Yusof bin Musa. Mahmud, the son of Sarawak Governor Tun Pehin Sri Abdul Taib Mahmud, was represented by his legal counsels Datuk Zainul Rijal Abu Bakar and Saadiah Din. The verdict for this appeal will be delivered on 14 July 2015. Datuk Seri Mahmud believes his former wife Shahnaz had been duped into believing that he has massive wealth running into billions. In a previous hearing on 2 September last year, he said his former wife had been made to believe by Canadian fraudsters Cullen Johnson and Elaine White that he had multiple off shore accounts to support her excessive divorce maintenance claims in excess of RM500 million. The fraudsters had fabricated astoundingly realistic-looking banking information that would lead one party to believe the other had millions of dollars in assets stacked offshore. They concocted Mahmud had multiple off shore accounts in all corners of the globe. Shahnaz testified in her ‘mutaah’ hearing that Datuk Seri Mahmud had off shore wealth in excess of USD700 million in Canada, the US, the Caribbean, France, Luxembourg, Monaco, Hong Kong and Switzerland. “The forged documents were obtained by my former wife and her team at a time when the fraudsters were running away from the arms of the law. The fugitives took refuge at Turks and Caicos Islands in 2010 where they continued to dupe clients in an international scheme that involved bogus promises of offshore millions,” said Mahmud. On 10 April 2013, the fraudsters were extradited to the US from a Turks and Caicos prison on charges of money laundering, tax evasion and several charges of fraud valued at over US$1m. They have been indicted and jailed. Mahmud also testified that an international conspiracy by Sarawak Report led by political activist Clare Rewcastle-Brown had a hand in this and that the alleged off shore wealth was even taken up by the Bruno Manser Fund with Swiss MPs. As a result, the Taib family was fully probed. On 24 September 2013, following accusations by Swiss MP Carlo Sommaruga, the Swiss Attorney General informed the Bruno Manser Fund and the public that no members of the Taib family held assets with Swiss banks after 1999. Prior to this date, two family members had held Swiss accounts.